Most sales reps spend less than half of their time actually selling (McKinsey , 2011). In our connected world customers are leaving digital fingerprints in LinkedIn, Facebook and other social networks. They tweet, blog and share content. Even those who are not active online are being mentioned by friends and colleagues. However, many sales and marketing organizations still rely on traditional, aging tools to find their customers. New technologies enable you to hone in on high-quality prospects based on what they do, the products they use, their skills and more. This translates into a flow of new leads delivered directly into your CRM when you need them. It also means improved sales efficiency and better closing ratios. 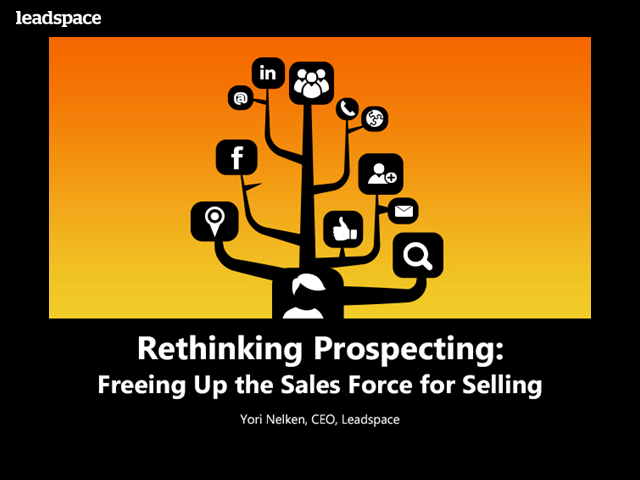 Yori Nelken, CEO at Leadspace, presents the new world of sales and marketing, and demonstrates the innovative intelligence tools that take sales prospecting to a whole new level. Sales prospecting has never been easier - or has it? Now more than ever, Salespeople have access to a plethora of tools and a sea of information. However, grabbing the attention of quality prospects and getting a reply requires a careful selection of prospecting tools. In this webcast we will share, from our experience working with hundreds of sales organizations worldwide, the best prospecting tools companies use - some old, some new - and discuss how prospecting is transforming in our connected world. Like many other companies, our sales team used to spend hours searching online for good prospects. They struggled with outdated contact info, and more often than not, it took them numerous calls to reach the right person in their target accounts. In this webcast, we will share the results of a focused project we executed to grow our pipeline using a combination of purchased contact lists and our new Leadspace prospecting solution. Leadspace helps sales and marketing professionals find highly qualified prospects by mining social networks, databases and the web. The webcasts present case studies and best practices of social selling and prospecting.